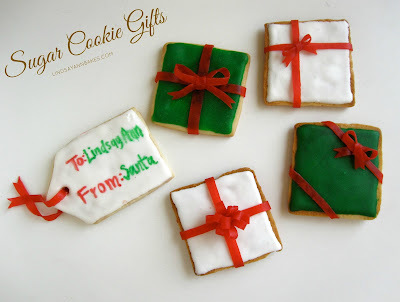 Adorable and completely edible gift-wrapped sugar cookies. They make a perfect gift, party platter or festive Christmas eve treat. To make these 100% edible gifts, simply bake and ice your sugar cookies. You can even use store bought cookie dough for a simple alternative! Once they are dry, create ribbon and bows out of fruit leather and transform simple square cookies into adorable little gift-wrapped cookies! Preheat oven to 400 degrees F. In a small bowl, sift or whisk together 2 3/4 cups flour, baking powder, and salt. Set aside. With an electric mixer, beat together softened butter and sugar on medium speed until light and fluffy, about 3 minutes. On low speed, beat in the egg and extract(s). Slowly add the four mixture until dough forms and is no longer sticky, adding extra flour as necessary. Roll out dough about 1/4 inch thick dusting with flour if it gets too sticky (Tip: roll out dough between parchment paper to avoid sticking to your work surface). Cut out square and rectangular shapes with a cookie cutter or slicing shapes with a pizza cutter or knife. Bake for 7-8 minutes, until edges turn slightly golden brown. Let cool. For the icing, mix sugar, milk, corn syrup and flavoring extract together in a small bowl until smooth. Divide icing into separate bowls and add food coloring until you have reached your desired color. Pipe, pour, spread or paint onto tops of cooled cookies. Let dry and set completely before decorating with edible ribbon, stacking, storing or packaging. Cut strips of fruit leather to create ribbon and bows and attach them to your completely dry iced cookies, using icing to attache the pieces if necessary. Store in an airtight container. 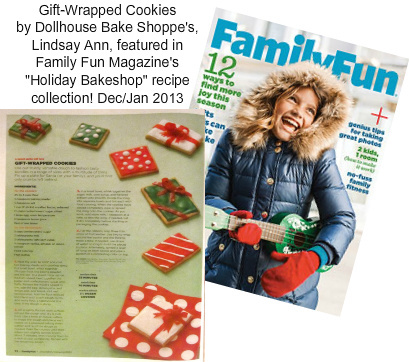 Check out my cookies in the December/January 2013 issue of Family Fun Magazine as part of my "Holiday Bakeshop" recipe collection!